As many of your know, we have recently launched Crunchify Forum just dedicated to all our readers to ask and submit queries you may have regarding WordPress tricks, Adsense Setup, Java exceptions, etc. 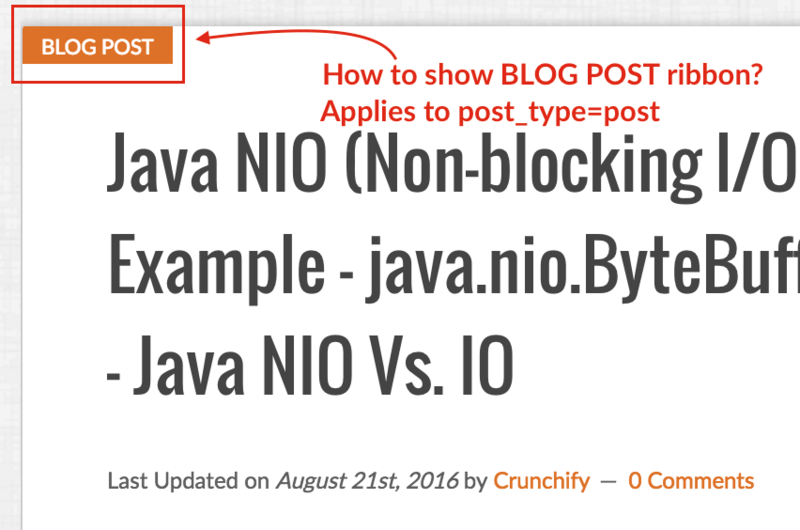 Few days back we got a questions from Simeon about how to add BLOG POST or BLOG PAGE ribbon like on Crunchify. Instead of replying to thread I’ve decided to create complete detailed tutorial which will help all Crunchify readers. Here is a screenshot for BLOG POST. As I’m using Genesis Framework, I do have below HTML structure for my blog. Just right click on any post or page on Crunchify.com and select inspect and you could verify below. As I know I have just modify CSS property for post and page, here is my code which I’ve put into style.css file. NOTE: here I do have entry too which will add ribbon to front/home page too. And you should see ribbon like above image. What about non GenesisWP themes? Well, idea is simple. Just try to find CSS property which is unique for your post and page and update above CSS code. It should work for other themes too. I still waiting at your reply. Why you no tell? Hi Maha – could you share your site URL? I’ll try to debug at my end. I now buy Magazine Pro. It no show anywhere!!!!!!! Hi, I add the code to my site. It appear on top right corner of screen. I are useing Smart Passive Income Pro. What you not telling? How I getting it on the post & page? Hello App. Thanks so much for taking out time to write this tutorial after I posted in Crunchify Forum. I want to let you know that I am very much grateful. Thanks again! You are welcome Simeon. Happy Blogging.